The use of wheeled rollator walkers can help to make it much easier for users to get around and to be able to take part in activities and get the exercise that they need. They are easy to use, and Allegro Medical offers a wide range of wheeled rollators from popular brands, such as Drive, Medline, Cardinal Health, and Nova. 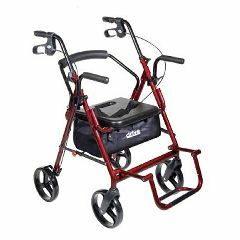 There is a range of walker options, including quality lightweight rollators at AllegroMedical.com. In addition, you can be sure you are getting great prices thanks to our Best Price Guarantee.